The Wasps arrived at Owlerton with previous away victories at both Exeter and Workington, both big tracks, and included in their ranks ex Owlerton favourites Neil Collins and Tony Atkin. Neil's past record speaks for itself, and while Tony never really set the track alight when a Tiger his current form is a different matter. Add Mads Korneliussen, tipped for the top league, and Elite guest Chris Harris and it looked as if the Tigers may have a fight on their hands. Factor in Sean failing his fitness test, the injury to Richard Hall in his first race, and Paul Cooper siezing a new engine while warming it up, and there was an upset just waiting to happen. Good job no-one told Ben Wilson. In his first meeting after being relegated to reserve he had the best night of his career and only missed out on a seven ride maximum when he was repassed by Neil Collins on the last lap of heat 14! Ricky trapped and quickly extended a healthy lead over Mads to win heat 1 in his own personal fastest time around Owlerton. Paul Cooper wasted no time in passing Kristen Lund who virtually stopped entering the third turn on the first lap. Ben looked comfortable winning heat 2 with Tony trying all the lines and nearly coming adrift on the last lap in second place. Richard Hall trailed the field in heat 3 and clipped Neil Collins on the third turn taking a horrible looking spill into the fence. He walked from the track nuring a sore arm and headed for the showers. André rounded Chris Harris on the third turn to claim heat 4, but having passed Karlis exiting the last turn Trevor's bike let him down just seconds later. Ricky trapped to make it three wins out of three in heat 5, but everyone was watching Ben in second place soaking up everything that Mads threw at him for four action packed laps. André was well beaten by Chris (or Chirs as the programme would have us believe) in heat 6, but he and Ben took heat 7 at a leisurely pace. Trevor trapped to win heat 8, but once again the crowd were watching the battle for minor placings as Paul and Tony Atkin had a tremendous race long scrap. I thought Tony's last bend swoop had done the trick but the referee disagreed. Ricky did a grand job on the first turn of heat 9 to sit on the tactical Chris Harris and allow Ben to scamper into the lead. Chris powered under Ricky and into second place on the first turn of the second lap, but all the home fans were willing Ben on and he just managed to hold the narrowest of leads to the finish. Following the interval Ben was out again, this time following Paul home with Neil Collins climbing all over his back wheel. Ben was out again in heat 11 for three on the trot, this time outwitting a tactical Mads, with André passing Kristen on the pits turn after a poor start. 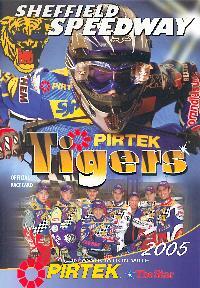 The Tigers lead was chopped in heat 12 with Neil Collins and Tony Atkin taking a maximum ahead of a pedestrian Ricky. It looked as though the lead might be extended in heat 13 with André disputing the lead with Chis Harris and Paul ahead of Mads, until Paul turned into the first turn on the second lap and Mads didn't sending them both hurtling into the fence. Paul was soon on his feet and feeling very aggrieved about being stuffed, even more so when the referee excluded him and not the real culprit. André made no mistake in the restart with a no nonsense first corner. Trevor Harding stood in for Richard in heat 14 but everyone's attention was on Ben who was unbeaten after six rides. Neil showed first but Ben wore him down and after a couple of good corners passed him on the inside on the third lap. Neil spoiled the party though with a lovely swoop around the outside which took him back into the lead on the last lap. Ricky's bike wouldn't start for heat 15 and he resorted to Trevor Harding's mount, while André nearly exceeded the time allowance returning to the pits for the correct helmet cover. Ricky trapped first but everyone filed past him on the back straight, which might explain some of Trevor's problems, while André was left to scrape the fence on his way to a comfortable win. An entertaining meeting but one which the 'Wasps' might have expected more from, especially with the Tigers down to just five men and suffering machine problems. Definately one for Ben's scrapbook though. Fingers crossed for Richard Hall. What a way to celebrate signing to double up for Eastbourne!